The DVD Review and the Extras Review are by Kevin Clemons. Image Transfer Review: In comparing the HD version with the original DVD, which was highly regarded by our reviewer Kevin Clemons, we find much better detail on the HD version, with crisper outlines and generally much better clarity. Color rendering is mildly better, with a good deal more shadow detail. Dust in particular comes across much better in HD, since its granularity is difficult to render in ordinary DVD. The costumes have a vividness and reality in the HD version that is much superior to the SD disc. The differences aren't enormous, but they're readily noticeable when viewed in 1080i. There are still a few moments of compression artifacting visible, however. In particular, visible ringing surrounds the rigging on the ship carrying Cruise to Japan. A word regarding the image transfer grade below: Early on in the DVD era, we tended to give high grades because of the huge improvement over VHS and ordinary television, only to realize later that there was plenty of room for improvement as the format grew. Thus the grade here is not meant to be compared to the standard DVD grade (the visual experience is far better than the best A grade for a standard DVD), but to allow for the possibility of improved transfer art and technology in the future. Extras Review: The extras are identical with those on the standard two-disc edition, though they are all contained on the single HD-DVD. They are, however, not presented in HD. The feature contains an extensive commentary by director Zwick, and while the track will become repetitive after having viewed the other extra features, it is an engaging track to be sure. Zwick discusses nearly every aspect of production from scouting locations to stunt work, and covers his choices in the progression of the story as the film was edited. It is clear that Zwick has a deep love for the project and he goes into detail about the various themes woven into the story. The director is a huge fan of his leading man, and touches on the willingness and determination of Cruise at several points. Tom Cruise: A Warrior's Journey, running nearly 13 minutes, focuses on the extensive training the actor underwent and his appreciation of the samurai culture. The next two documentaries feature director Zwick. Edward Zwick: Director's Video Journal presents footage from the set with commentary by the film's helmer. There is little to be learned here that can not be heard on the exceptional commentary. Making an Epic: A Conversation with Tom Cruise and Edward Zwick runs just under twenty minutes and is a candid conversation on the set between the director and his star about their mutual respect and the pleasure of working with a top flight cast and crew as well as how they conveyed the emotions that they strove to achieve. 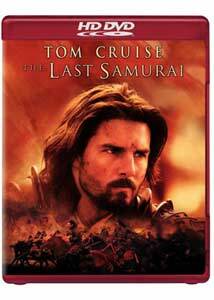 The Last Samurai is grand and thrilling filmmaking. Director Edward Zwick has created a moving story that will stand as a benchmark in his career, as well as that of his leading actors. Highly recommended. The HD version improves significantly upon the already attractive standard DVD.